The 2014 International CES was last week, and I was there, walking acres and acres of exhibits looking for examples of bona-fide innovation. But amid the sea of slightly larger televisions in the Central Hall and me-too smartwatches in South Hall, truly compelling products were hard to find. That said, I've rounded up five products from the show that I would actually spend my own hard-earned money on. Indeed, I expect to own all five of these before the year is out. Revolv. Smart home technology was everywhere at CES, and it has gone mainstream. Unfortunately, all of the usual devices -- smart locks, music systems, thermostats, remote controllable lights and outlets -- require separate apps and don't talk to each other. That's where Revolv comes in. This hub and smartphone app pulls all of these separate apps into a single experience -- and lets you automate actions. Revolv can sense when you're arriving, for example, and set a slew of activities in motion to welcome you home. Or you can program other actions to occur like full home macros. It's available for $300. 3Doodler. It's a cross between a 3D printer and a glue gun. A hit on Kickstarter earlier this year, 3Doodler shows that innovation is alive in America. You use 3Doodler to draw or sculpt freehand, in three dimensional space, and the extruded plastic hardens almost instantly, allowing you to make any structure you like. It costs just $99. I suspect the crafters, DIYers, and artists this will appear to would have bought it at twice the price. Channel Master. You already know about TIVO, but you might not like the monthly subscription fee. Channel Master is an exciting alternative, designed expressly for over-the-air TV broadcasts -- ideal for cord-cutters trying to save money by doing away with cable and other monthly fees. Channel Master is a dual channel DVR that gives you channel guide information for free. And it doesn't include its own hard drive -- you add your own, so you can choose the capacity you need. It costs about $250. Lit Motors C1. Here's the first of two transportation solutions I wanted to take home from CES. The C1 is the working name for an all-electric, gyroscopically stabilized two-wheeled vehicle that should enter production around the end of 2014 for under $20,000. It boasts a 200-mile range (similar to the Tesla) and a top speed of about 100 mph. The C1 is technically a motorcycle, but Lit claims drivers will be exempted from needing a motorcycle license or wearing a helmet, since it's enclosed in a car-like shell and the gyros keep it upright. OneWheel. Finally, this kind of oddball contraption is the sort of gem that brings me to CES each year. 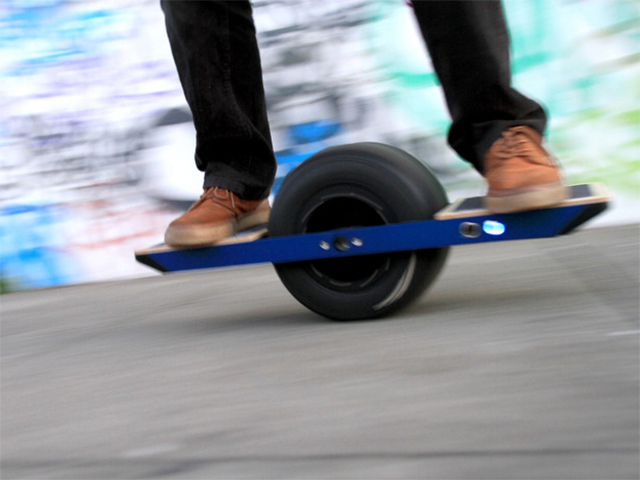 OneWheel is an all-electric self-balancing skateboard. You might not want one (though, in the interest of full disclosure, I do), but in the words of Marty McFly, "your kids are gonna love it." OneWheel has a 4-mile range and top speed of about 15 mph. The motor is fully integrated into the single wheel in the middle of the board, so there are no visible electronics or mechanicals on the device. According to the inventor, it only takes a slight lean forward and back to control the speed and a lean to the sides to turn; even novices can master it in minutes. This skateboard version of the Segway costs about $1,300 and you can back it on Kickstarter now, for a fall 2014 delivery.